When the pioneers crossed the Great Plains on the Santa Fe or the Oregon Trail, they often went for a long time without seeing any trees. The prairie was frequently seen as a very foreign and hostile environment to people from the Ohio valley, the Appalachian mountains or New England since they were used to forested surroundings. No trees meant no wood for cooking. Dried bison dung was used for cooking fuel instead! No trees also meant no shade, which can be very precious on a hot day in summer. This and other factors led one early explorer to misname the area as the "Great American Desert".When the pioneers crossed the Great Plains on the Santa Fe or the Oregon Trail, they often went for a long time without seeing any trees. The prairie was frequently seen as a very foreign and hostile environment to people from the Ohio valley, the Appalachian mountains or New England since they were used to forested surroundings. No trees meant no wood for cooking. Dried bison dung was used for cooking fuel instead! No trees also meant no shade, which can be very precious on a hot day in summer. This and other factors led one early explorer to misname the area as the "Great American Desert". There is a tree that is well-adapted to life on the prairie, however. 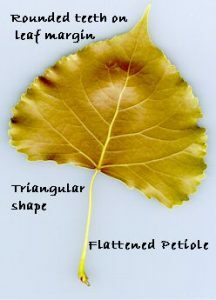 You can recognize it from afar during the growing season by the shiny leaves that shimmer and shake in the wind. The pioneers were always glad to spot one of these trees in the distance, since it offered the possibility of wood and shade. It also represented the chance of finding water, since this species likes to keep its feet wet, so to speak. That species is the cottonwood tree. -Cottonwoods can be either male or female. It is the fluffy white seeds produced by the females during early summer that give the tree its name. [Cotton for clothing comes from the true cotton plant (Gossypium sp. ), not the cottonwood tree.] The seeds are very small, 1mm wide by 4 mm long, which is quite remarkable considering that they can become one of the largest trees in North America, up to 100 ft. high with massive trunks over 5 ft. in diameter. -Trees had to survive prairie fires in order to live on the Great Plains. Cottonwoods did this by typically growing on the edges of rivers and streams and by developing a very thick, corky bark upon maturity. As their seeds are dispersed by the wind, many end up landing on the surface of water and are then stranded along the waterline on sandbars, islands and river banks. If the river level does not fluctuate too much, allowing the seed to establish itself, a new monarch of the plains will begin its life. As the water level drops with late summer droughts, one can often walk along a sandbar and see a row of these newly sprouted cottonwoods at the former waterline. -Cottonwoods can live to be over 100 years old. There are cottonwoods on the Great Plains today that were living when the great herds of bison still roamed the prairie. Cottonwoods are related to poplars and aspens, with which they share the same shaking, shimmering leaves. -The heartwood typically rots from the larger limbs and trunk of a cottonwood. If a windstorm breaks one of these hollow branches off, providing access to the interior, they can provide homes for squirrels, raccoons, and opossums or even a hive of honeybees. After settlement, other kinds of trees became established across the Great Plains, due to the control of wildfires and intentional planting of shelterbelts and woodlots. Ribbons of forest follow the watercourses across the prairie where formerly only a few solitary cottonwoods could be seen. These so-called gallery forests are a significant part of the habitat mix on the Great Plains today, giving forest-adapted animals places to live they never had before. In summer, while looking over a cottonwood tree you may spot a large black and white insect. This is the Cottonwood Borer, (a type of beetle) one of the largest insects in North America! 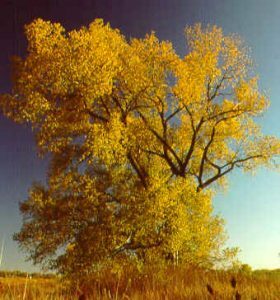 As summer changes to fall, the leaves of the cottonwood turn a bright yellow, making a vivid contrast with the clear blue skies of autumn. At this time, they stand out from the other trees which share their habitat nowadays, allowing one to easily pick out the cottonwoods - true pioneers among the latecomers on the modern prairie.